Chlamydosaurus kingii is one of the most familiar of Australia’s dragon lizards. It is thick limbed with a long tail and averages about 30 inches in length. The tail is striped with a deeper colored tip. Chlamydosaurus kingii are considered to be what is called a dragon lizard. Their mouth and tongues are pink or sometimes yellow, but the most incredible aspect of the small lizard is its frill. On its neck is a large ruff, or fille that rises instinctively when the lizard is startled, or becomes alarmed. It is a thin fold of skin actually, that surrounds its neck and can measure a foot across when it is raised upright. When it is not erect it lays cape like around the lizards shoulders until it is raised again. The Chlamydosaurus spends a great deal of its time resting on the trunks of trees and lower branches, and are diurnal in nature. Females lay eggs during the wetter seasons. The female may lay as many as fifteen eggs but usually the number is 7 or 8 eggs per batch, which is called a clutch. The nest is located flatter areas of sandy soil with surrounding grasses that let the sun touch the nest nearly all day. 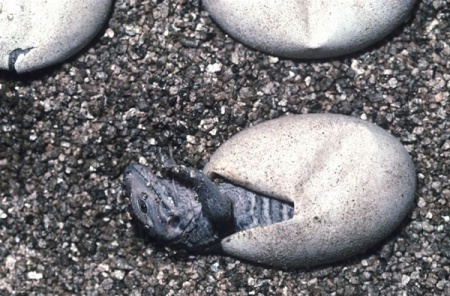 The eggs will hatch in about 6- to 70 days. These lizards are what are called arboreal, spending nearly all of their time in the trees. They will move to the ground to feed, and usually for that reason only. They are called insectivores, meaning they eat primarily insects as a diet. The Chlamydosaurus has been seen to eat small mammals and pieces of meat as well as insects. Although many people have tried to capture them as pets, liking the looks of the frill when it is extended, they do not respond well to captivity. It will only very rarely display its frill when captive and is far better left alone in its natural habitat. The name is bit hard to pronounce and very similar to dinosaurs. Its beautiful and i like reptiles.